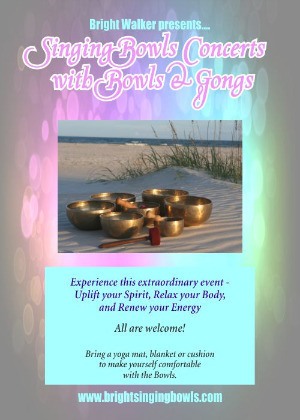 Join Bright and Linda Carlsen for a one hour evening event of relaxation, reflection & rejuvenation. 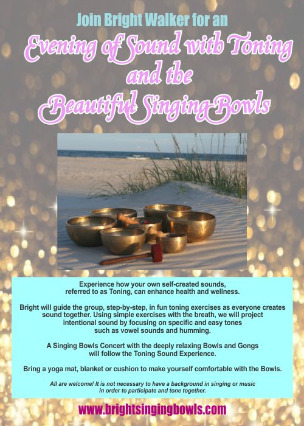 The first 30 minutes Linda will lead the group in gentle & soothing yoga poses, and Bright will follow with 30 minutes of tranquil tones with the Singing Bowls. Reserve your spot - space is limited! Immerse in a mini-retreat of self-care with the relaxing power of sound. *The 3 classes offer an opportunity to experience and practice simple and easy relaxation techniques. *The classes will integrate the beautiful sounds of the bowls, gongs, and chimes with different techniques such as breath, imagery, and self-created sound. 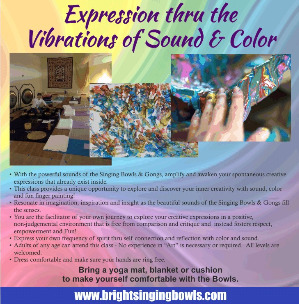 *Everyone will have a hands-on opportunity to play the singing bowls and begin a simple practice of relaxation. *Inspirational thoughts, reflections, and poems will be included to instill optimism and enthusiasm. *A renewed sense of well-being is encouraged by connecting to inner stillness, peace and relaxed awareness. No experience is necessary. Remember to being a yoga mat for sitting comfort. Space is limited, pre-register to save your spot! Call Bright to schedule a Workshop for your group!